I did it! I did it! 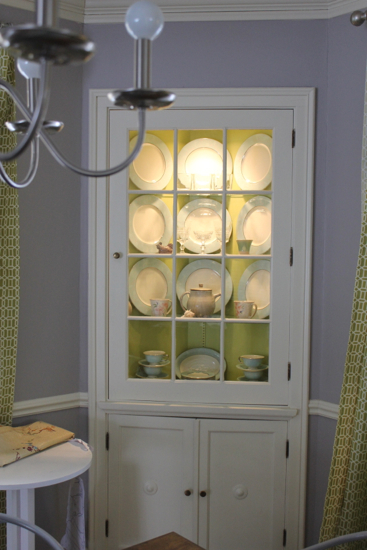 I finally painted the insides of the built-in corner china cabinets in the dining room. 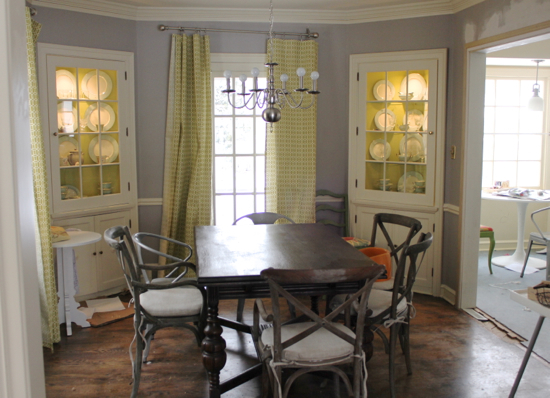 This is the same color I used for the front door, Farrow & Ball Churlish green. You can see my door here. I ordered the fabric for the curtains (I'll also make Roman shades for the kitchen with the same fabric. Click here for a post on making Roman shades.) hoping it would match the paint. I got lucky, because they are very close. I still have several things to do in the dining room, like straighten that darn curtain rod. It should be one of the simplest DIY projects: hanging a curtain rod. But that particular rod has been annoying me since I put it up. But enough about that. We're still waiting on 2 more matching dinging chairs. 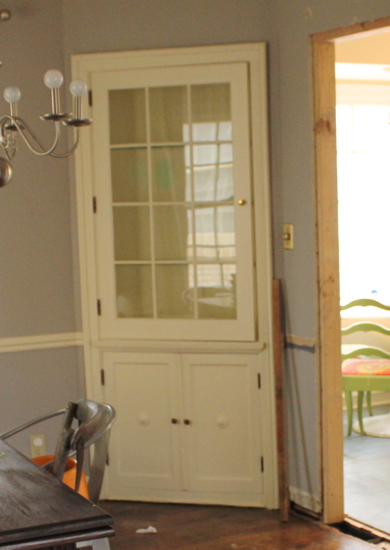 Then I have to paint the wall and trim to the right where we opened up the wall. Of course, we have to tile the kitchen and put in a threshold piece underneath the wall opening. And as always, some general picking up and cleaning. Here's a close up of the right cabinet. I don't know why I waited so long to paint. I think I was nervous it wouldn't look good, but I love this color so much. My grandmother's pale blue china looks really good against it, I think. What made another big difference was propping the dishes up. Since I have the matching china, I figured is was best to show it off! I didn't just prop up the dishes without securing them, but my method may be a little controversial... I'll save that explanation for another post. I also brought out the crystal and took out the odd accessories and Japanese pottery. I'm still working on a way I can display the earthy Japanese ceramics somewhere else. 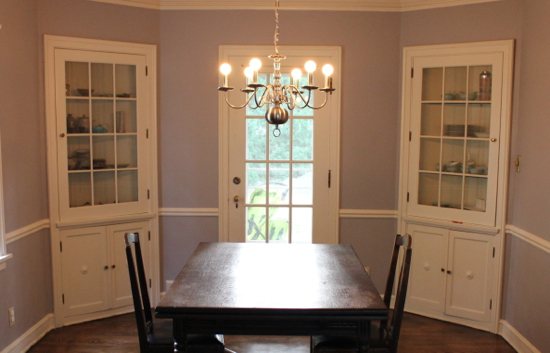 Here are some views of how the dining room and china cabinets have been progressing. 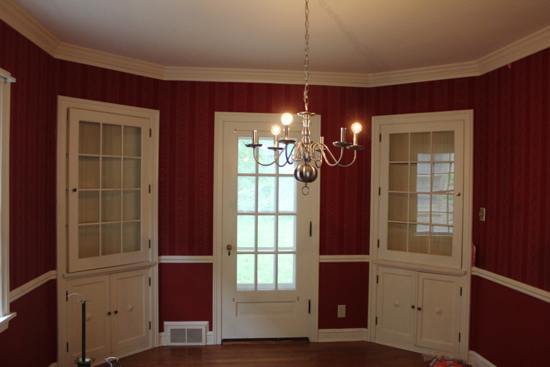 The shot above was right after we stripped the red wallpaper and painted. Going back a little further, here's what the old wallpaper and paint looked like when we bought the house. And that's how my china cabinet has been looking for the past year or so. 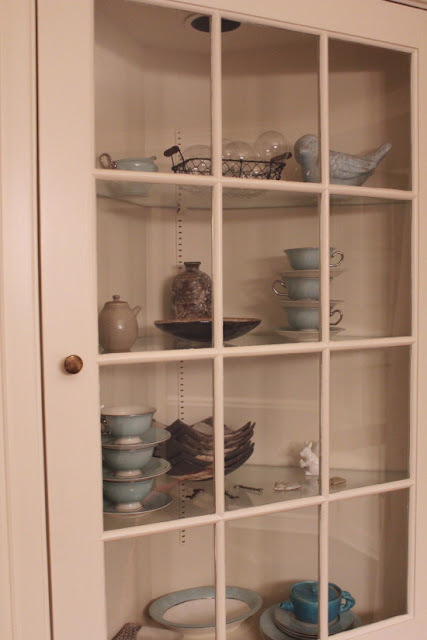 Can you see that swatch of pale green in the empty cabinet? I had that on there for a whole year! It was a pale minty green and not right at all. I was so confident about Churlish Green, though, that I didn't even do a swatch. It worked out for me this time. 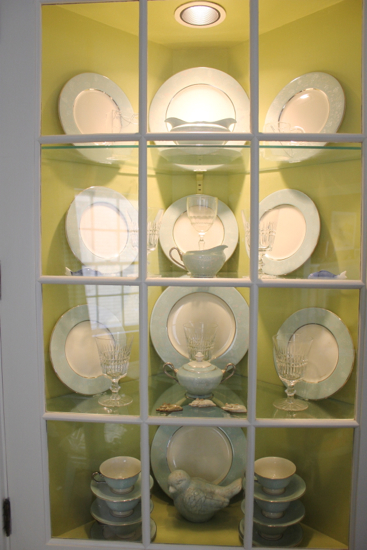 Meme would be SO happy you have so beautifully displayed her china. The cabinet is lovely. 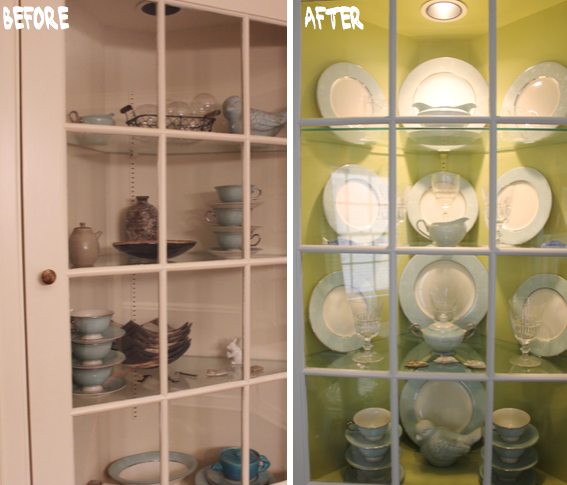 I love what you did to your cabinets! What a gorgeous makeover. 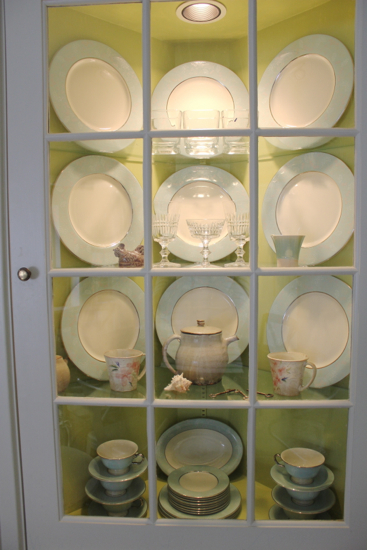 Those pale blue China definitely looks good against the Churlish green paint. And that color somehow liven up the room. Seeing this got me inspired to work on my DIY projects that has been pending for months now. It's time to shop for some tools online to get me started. I'm 100% thrilled my post inspired someone. And it also helps to have an encouraging comment. I'm not always sure I've made the right decorating moves! I still have a lot of things to work on in the house including the vanity unit and the china cabinets. Anyways, thanks for this inspiration. It turned our amazing!